Brief program at 5:30; light hors d'oeurves and drinks will be served. With distinctive architecture and a fresh modern design, the city block where the former Mercy Court building was located has been transformed into a new Academic Center for Mercy College. With the addition of a new 22,000-square-foot office, academic and laboratory center, the Center features classroom space, faculty and staff offices, a fitness center, and apartment-style housing. This evolution allows Mercy College to consolidate the Mercy College Training Center, Emergency Medical Services program, Medical Laboratory Science and multiple locations of the nursing arts lab under one roof and in one city block. The revitalization has given a whole new look and feel to the campus, as students have far more convenient access to the library and other student services. The classrooms will begin to be occupied in spring 2018. 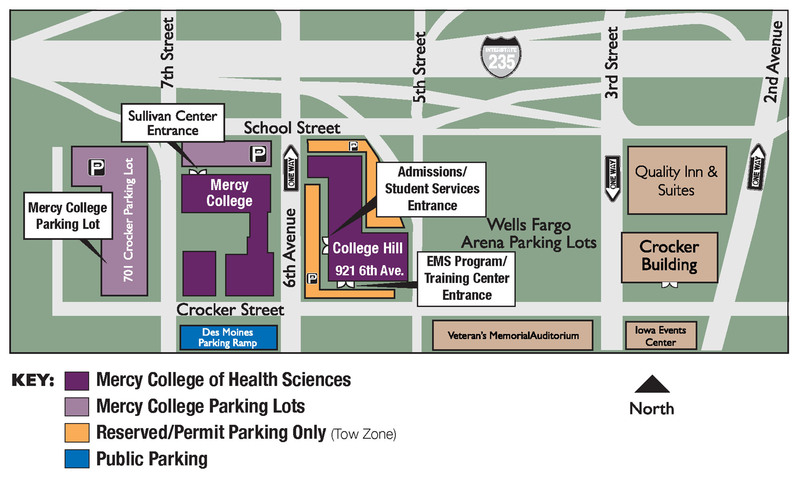 The College’s admissions, financial aid, student nurse and the recently-dedicated Josephine Norkaitis Student Success Center can also be found on this city block. The development of this space ensures that students have the best opportunities to learn and engage in the most up-to-date and technologically advanced facilities in the Des Moines area. On this same block, Newbury Living is creating 86 housing units in numerous configurations under the name, College Hill Apartments, to meet the changing needs of our students. The apartments are on floors two through five. We anticipate Mercy College students will be excited about living near campus. The College Hill Apartments are leased and operated by Newbury Living. You can see more information online at www.collegehilldsm.com.